Allen Funt created television's Candid Camera. But he was not the star. If Funt were alive today, he would concur. Funt, who took the idea of a roving microphone capturing unguarded moments from the days of radio and turned it into a TV phenomenon, also never liked the notion that his show made fools out of unsuspecting people. Funt preferred to think that Candid Camera was more of a series of case studies on human behavior, rather than a gag-filled half-hour. Regardless, the star wasn't Funt, though he hosted the in-studio segments and often appeared during the hidden camera "case studies." The stars of Candid Camera were always the people---the folks whose behavior was being chronicled in a very unfiltered and unscripted way. Therefore, the laughs that resulted were always from the audience's glee at the reactions of the unwitting, caught by Funt's hidden camera. I wonder if you could get away with calling them "Ethnic Festivals" these days. I've kind of lost track of political correctness. I don't know what is acceptable terminology anymore. But what I do know is that, as a high schooler and into my college years, my buddies and I would descend on Hart Plaza in downtown Detroit and partake in "ethnic" food, people watch, and maybe have a nip or two. Yes, it was before we were of legal drinking age. Amazing how enterprising teenagers can be. Anyhow, they called them Ethnic Festivals and they would rotate throughout the summer, on the weekends. You know---Greek, Italian, Arab-American, etc. The Plaza would be host to live music, vendor stands/kiosks and underneath, in the below-ground portion of the Plaza, were loads of food nooks. Imagine an underground food court, like they have at the malls. There's some sad irony in the Ray Rice conundrum as far as the National Football League is concerned. The NFL is a league that has a legacy of toughness and images of "real men" doing battle on mud-strewn gridirons, snow and other unfavorable elements. It's a league whose players like to throw around the word "respect," whether it's not getting enough or giving too much. 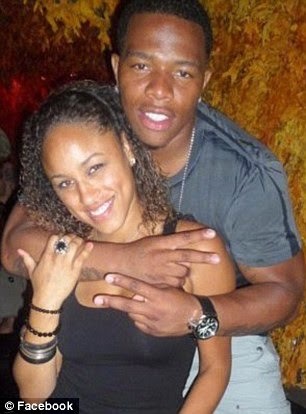 "Real men" and "respect" don't fit Rice, the ex-Baltimore Ravens running back who was caught red-fisted via security camera, cold-cocking his fiancee in an elevator last February. This blog is expressly for my non-sports rantings, but just because the first several paragraphs have been littered with NFL references, the Rice situation has nothing to do with pro football, per se. In a perfect world, Derek Flemming would have been able to march up to the driver of a car that cut him off, express some anger, and get back into his own vehicle---without fear of losing his life. The 43 year-old husband and father of two young children would have vented his anger and frustration and still lived to re-tell the story to friends, co-workers and family at every opportunity. We do that a lot, you know---turn storyteller when we are wronged, whether it's from poor service at a restaurant to being incredulous at a retailer's return policy, among other things. But then we get it out of our system and we move on, until someone else relates a story that fires your mental file cabinet into gear and your story gets retold yet again. But Flemming paid the ultimate price in an act that unfortunately will have people---like yours truly---getting into "blame the victim" mode.